“Our Savior is our true Mother in whom we are endlessly born and out of whom we shall never come”. 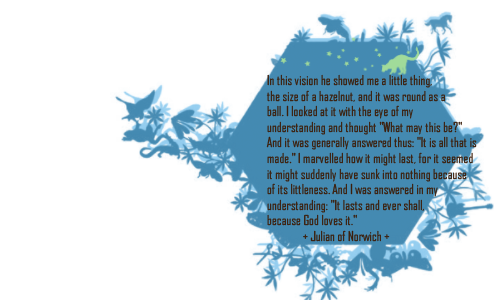 The feast day of Dame Julian of Norwich was last Thursday, May 8th (in the Anglican tradition), and it was on that day after reading some of Julian’s words about God & spirituality that I felt compelled to write the poem which follows. A week late and a dollar short – isn’t that the saying? Anyway, I’ve read some of Julian’s writings before and have found the intimate and loving way in which she expresses her devotion to, longing for, and connection with the Divine to be very inspiring to my own spirituality. I also love how she addresses the Divine using both masculine and feminine pronouns, which is quite progressive for a laywoman of the twelfth century. If you aren’t familiar with any of her writings, and are inclined towards the mystical side of Christianity, I highly recommend reading them. yet held in one’s hand. when we bind ourselves to thee. Even in darkness, there’s love.